In 2012, 257,887 immigrants became permanent residents of Canada. Of those, 84,499 were children and youth between birth and 24 years. Of the permanent residents under age 25, the majority, or 66% (56,085) received residency status under the economic immigration class. Of those who immigrated to join family members already living in Canada (family class immigrants), there were 15,368 children and youth – making up 18% of children and youth. Another 10,810 people under age 25 obtained permanent residency status in Canada as refugees after fleeing their home countries (13% of all child and youth immigrants). 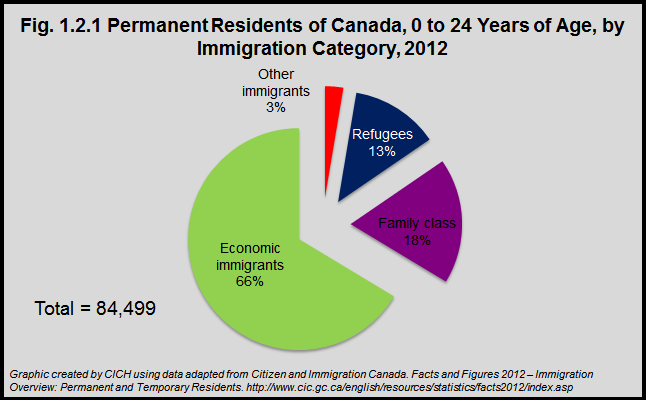 Immigrants to Canada are grouped into four classes: Economic, Family, Refugee and Other. If an economic immigrant sponsors his or her spouse and children to immigrate to Canada once he or she has already arrived, the spouse and children are considered family class immigrants.